UK company Fairfax Saddles is renowned for its use of scientific testing and research when it comes to designing the best possible saddles for elite horses. 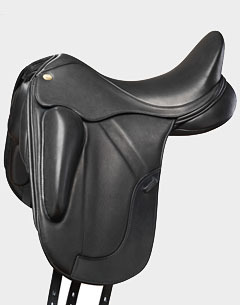 The Gareth Monoflap Dressage saddle is a typical example of its success. Fairfax developed the concept in conjunction with 2014 WEG team silver medallist Gareth Hughes, who wanted a saddle that aligned him more forwards and ‘in’ over the horse’s centre of balance. The end result is a saddle that enables the rider to feel a closer connection with their horse while allowing the horse to move more freely behind. In addition, Fairfax’s unique Performance Panel separates the weight-bearing part under the rider’s seat from the part under the rider’s knee which lies over the horse’s shoulder. Scientific testing shows that this patented design affords the horse improved limb extension, joint flexion and gait symmetry. The surface mounted thigh blocks are specifically designed to give the rider greatly enhanced support without restricting their position. Following the success of the Gareth Monoflap, Fairfax asked Rebecca Hughes to add some glamorous touches to produce a more feminine and elegant saddle. Rebecca is renowned for selecting and producing young dressage stars of the future and is also much admired as a style icon! The Rebecca Monoflap retains all the features of her husband’s namesake but benefits from the beautiful addition of snakeskin print on the cantle, plus grey welting on the seat and stitch lines on the flap.